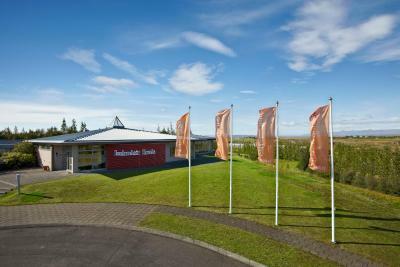 Lock in a great price for Icelandair Hotel Fludir – rated 8.4 by recent guests! The room was big and there was a jacuzzi out back. 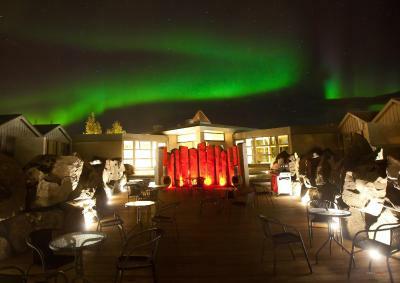 There’s also an option for the staff to wake you up if there is an aurora sighting which is a big thumbs up for me. 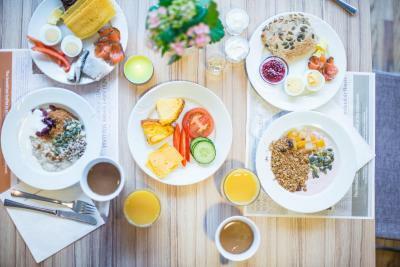 Breakfast buffet also offers a wide variety of selection. 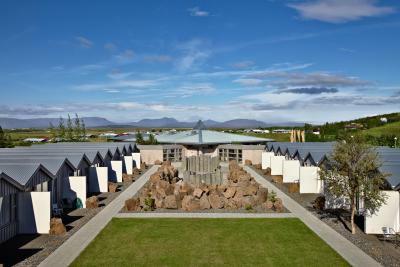 Perfect location for touring around Golden Circle. Fluidir pool across the street. Hotel has outdoor hot tubs as well. Very nice dining room and menu, excellent food. Expresso machine as well as regular coffee, wonderful eggs. 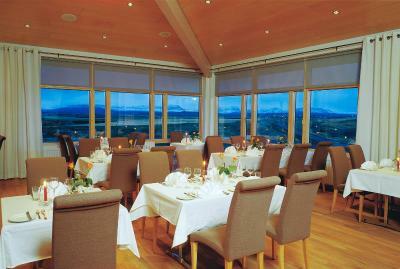 The view of Langjokull Glacier from the dining room and terrace is unparalleled. 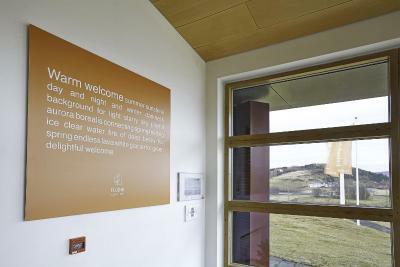 As well the elevation from the property allows for an excellent vantage point to view and take pictures of the Aurora. During our stay they were blazing over the glacier in orange (condition which occurs when the levels of neon are excited). Fabulous! 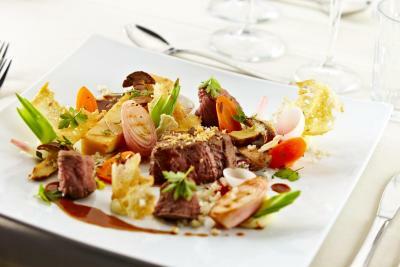 The dinner was also excellent and the staff both helpful and personable. As well the two thermal baths in the interior courtyard are a welcome respite after a day on the road or in the evening. Also a great place for Aurora viewing. Fludir offers a great approach to both Pingvellir and Geysir on roads that are not over travelled by tour buses. Beautiful hotel & setting with modern, clean rooms. 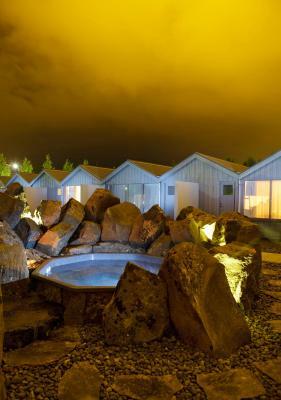 Great shared outdoor area with hot tubs for viewing Northern lights. 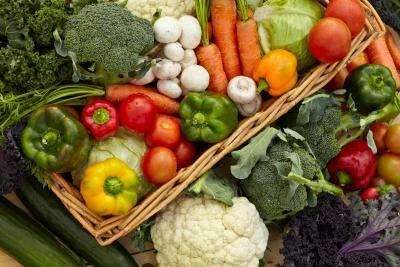 Very good food - though somewhat limited in choices if you are there for more than one night. The room was stylish. Hotel is centrally located, but it is a small village. There is a private hot tub area in the courtyard. The room was clean and a good size. The hotel is in a good location for the Golden Circle. The food at the restaurant was fairly good. 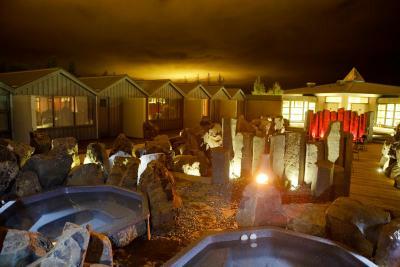 Comfortable, the courtyard layout with hot tubs underneath the sky seems ideal for northern lights viewing. Nice room with a great hot tub right outside the room! Very tranquil, quiet & relaxing. Loved the hot tub outside. Icelandair Hotel Fludir This rating is a reflection of how the property compares to the industry standard when it comes to price, facilities and services available. It's based on a self-evaluation by the property. Use this rating to help choose your stay! 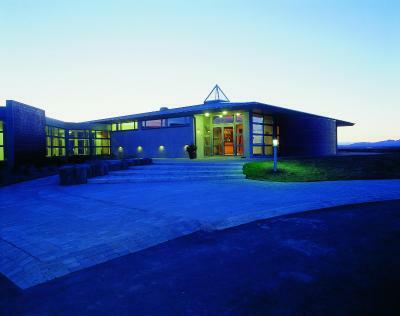 Hotel Fludir is just 20 minutes’ drive from the Great Geysir and Gulfoss Waterfall. 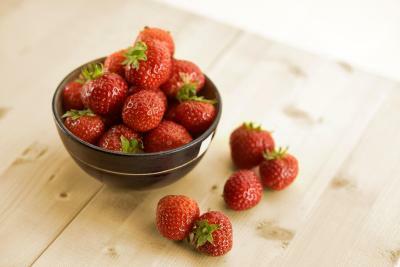 It offers Wi-Fi internet access. All rooms have wooden floors and a patio with garden access. 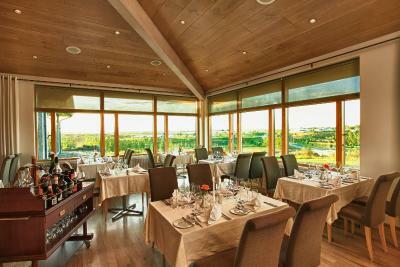 Icelandair Hotel Fludir’s restaurant serves traditional Icelandic food made from organic produce. 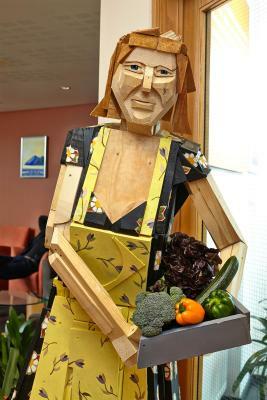 It also offers views of Midfell Mountain. The lobby bar is a pleasant setting for a relaxing drink. The staff can help arrange activities like fishing and hiking trips. Relaxation options include a terrace. Reykjavik city center is a 1-hour drive away. Parking is free at the hotel. 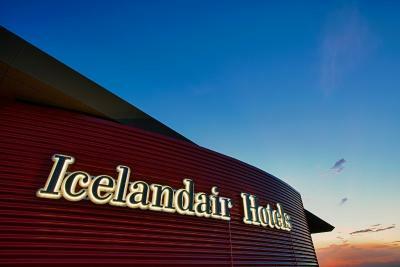 When would you like to stay at Icelandair Hotel Fludir? This room includes a terrace, TV and private bathroom with shower and hairdryer. 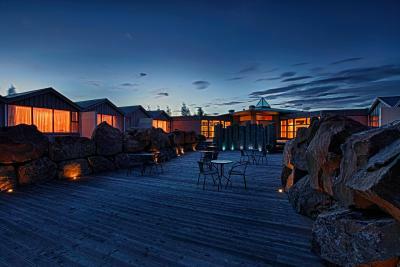 House Rules Icelandair Hotel Fludir takes special requests – add in the next step! One child under 13 years is charged EUR 25 per night in an extra bed. Icelandair Hotel Fludir accepts these cards and reserves the right to temporarily hold an amount prior to arrival. 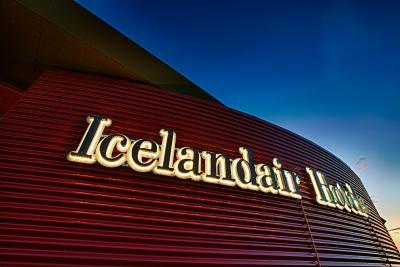 Please inform Icelandair Hotel Fludir of your expected arrival time in advance. You can use the Special Requests box when booking, or contact the property directly using the contact details in your confirmation. The bed is too soft for me, as well as all the beds is Iceland. The hot tube they have is very good. 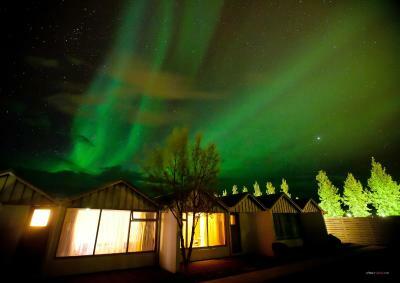 They have wake up call for the Nothern Lights, although we were not lucky. Location is good and hotel is good. Breakfast should have been included in the room rate. Staff were very helpful and enthusiastic. Wise choice for breakfast, and plenty available. Loved the wake up call for northern lights and room was warm and cosy. Lovely place near secret lagoon and dinner was lovely too. Great hotel and great service, the restaurant was delicious. They even call you in your room when there are northern ligths. We totally recommend ! Simple, well-maintained, comfortable place in Fludir. Staff were all excellent, generous in answering all questions, and helpful. Would come back again! Wake up call for northern lights! This was amazing. No way to stay awake allnight waiting for the lights with children. The wake up call woke us up at 1.30 am and we had an amazing sighting. Back door from the room directly on the garden with sharing thermal pool. No kettle to make a hot drink. Great rooms, felt more like an apartment than a hotel room. Door direct into the courtyard where there were the two hot tubs. Great location to visit many sites. Nice room with direct access from the bathroom to the hot tubs and a seating area outside. The mattresses were uncomfortable. You could feel the springs so perhaps a pillow top or something. We loved the cleanliness, hot tubs, breakfast, view, and ease.